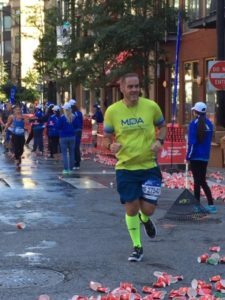 But completing six marathons is not Pat’s biggest accomplishment: He has been the top single fundraiser for MDA at the Chicago Marathon since Team Momentum’s inception in 2014. 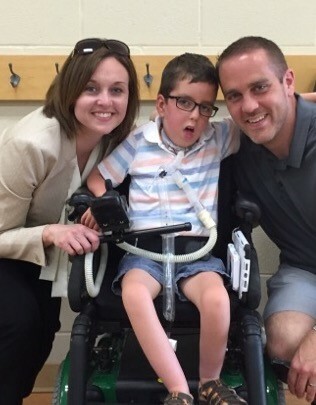 Pat’s fundraising strategy is simple: tell potential donors about his son Finley. And Finley works hard. 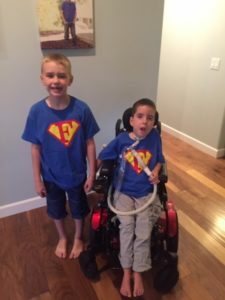 “We weren’t always sure that Finley was going to talk. One of the main parts of his disease is weakness through the lower face and vocal chords in the trunk area,” Pat says. And now? But with some convincing from his wife, he decided to sign up. “I wouldn’t say I’m a wonderfully athletic person or gifted in that way, but I was always involved in sports. I never liked running, but I’ve learned to love it now,” Pat says. Pat now gets up before 5:00 a.m. two to three times per week with his running partner, Jerry Kitter, who’s also a part of Finn’s Fighters. “The longer the run, the better,” Pat says. 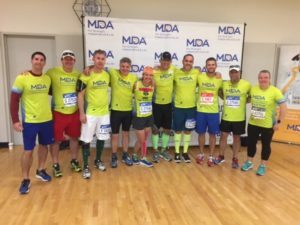 Join Finn’s Fighters and Team Momentum by dedicating your miles to helping kids like Finley live longer and grow stronger!